Music is an integral part of our common spiritual life and our model for music in the liturgy is Jesus himself, who sang psalms with the apostles at the Last Supper. It is among the most joyful and sublime offerings we make to God—every Sunday, at parish events, and in worship services. We believe, as St. Augustine held, that to sing is to pray twice and music is an integral part of our participation in the work of God. Through music, prayer is given more graceful expression, the mystery of the liturgy more openly revealed and minds can be raised to heavenly things by its beauty. Anyone can be involved in music at St. Alban’s — whether as a dedicated choir member, an occasional instrumentalist, or an enthusiastic congregational singer. Even the engaged and active listener has an important role. Jeremy Filsell is our Director of Music. Contact Jeremy if you have questions about being involved in our music program. Our current MUSIC SCHEDULE. This principally volunteer choir of around 30 members, the nucleus of which is formed by our eight professional section leaders, involves singers with a wide range of musical skill levels and sings the year round. Volunteer singers are always welcome to join us. Rehearsals are held on Thursday evenings 7:00-8:15 p.m., and we meet on Sunday mornings at 8:00 a.m. to rehearse for the 9:00 a.m. service, except during the summer. 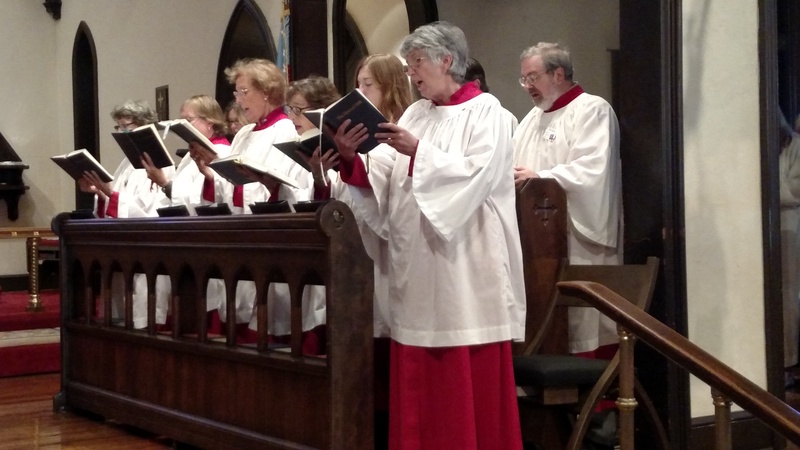 The principally professional choral ensemble sings every Sunday at the 11:15 a.m. Eucharist (fully Choral once a month) and for other events and special services. They serve as section leaders in the St. Alban's Choir as well as singing as a separate ensemble. Volunteer singers may join the Schola Cantorum by audition. Please contact choir director Jeremy Filsell to learn more. Children from age 7 through 12th grade sing in our choristers program, which utilizes the Royal School of Church Music's highly respected VOICE for LIFE program for training and spiritual development. Learn more. Anyone and everyone is welcome to sing at the 10:00 a.m. summer service. Come to the choir room under Nourse Hall at 9:00 a.m. No additional preparation is required and vestments are provided. Can you clap your hands and march in the light of God, or play any kind of instrument? If so, you make a fine music leader in Children's Chapel, which meets every Sunday in Nourse Hall at 10:00 a.m. during the summer (at 9:00 a.m. during the school year). Contact Noell Sottile to learn more or just show up. The organ at St. Alban’s was built by the Di Gennaro-Hart Organ Company and dedicated on September 20th 1998. Its builder, Michael Hart, provided this background and shared some "secrets of St. Alban's organ" at an OWLs luncheon. OWLs committee member Lacey Gude provided the introduction. Singing in unfamiliar places, whether grand cathedral spaces, ancient catacombs, or sites of human tragedy or triumph, is a sacred experience in its own right. Choirs from St. Alban’s have made pilgrimages to England (2004), Italy (2008), Austria and the Czech Republic (2010), England (2012) and France (2015). More video from the choir pilgrimage to France, 2015. Praise God for the gift of music which can exceed our capabilities of expression through spoken word and can allow us to access the depths of our emotional experience, drawing us closer to God.